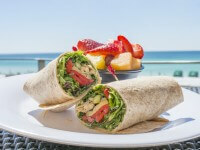 One of the most popular dining spots at Hilton Sandestin Beach Golf Resort & Spa is Barefoot's Beachside Bar & Grill. As its name suggests, this restaurant overlooks the resort’s stunning beach, with its bright white sand and emerald green water. It’s also a place guests can comfortably enjoy while barefoot. Barefoot's is housed in a large, open-air space with both outdoor and covered seating. It’s located adjacent to the resort’s two outdoor pools as well as to the beachfront sunbathing deck. 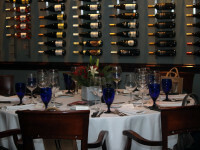 Barefoot's offers an amazing, unobstructed view of the Gulf of Mexico, friendly service and a festive atmosphere. 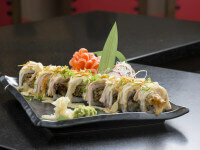 The restaurant’s menu features delicious casual fare and an array of creative cocktails. The salads include Citrus Grilled Shrimp Salad and Fresh Catch or Grouper Salad. The appetizer list features Chicken Quesadillas, Chicken Fingers, Smoked Tuna Dip and Hungry Man’s Ultimate Nachos, made with fresh, house-made chili and hot queso. Raw bar items include Oysters on the Half Shell, Peel-and-eat Shrimp and Snow Crab Clusters. Entrees include burgers, hot dogs, wraps, fresh fish sandwiches and fried shrimp. Barefoot's also has a gluten-free menu featuring nachos, raw bar items, salads, and grilled seafood, shellfish and chicken. 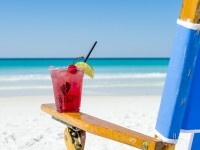 The drink list is extensive, with Beachview Favorites including High Tide (Three Olives Vodka, Flor de Caña Rum, El Jimador Tequila, Triple Sec, Amaretto, Pineapple, Cranberry & Citrus Juices) and Beach Brella (360 Vodka, Melon Liqueur, Peach Schnapps, Raspberry Liqueur, Cranberry & Pineapple Juice). The drink menu also includes several different frozen drink creations, a large beer selection and non-alcoholic options like sweet tea and juices. Guests can watch sports on several flat-screen TVs surrounding the outdoor bar portion of the restaurant, and when the weather is cool, they are welcome to sit by Barefoot's fire pit to roast marshmallows. Prices range from $6 to $9.75 for drinks, and from $10 to $21 for meals (does not include items at market price). On the pool deck of the Hilton Sandestin Beach resort. FRIDAY- SATURDAY 11 A.M.-9 P.M.
FRIDAY- SATURDAY 11 A.M.-8 P.M.
FRIDAY- SATURDAY 8 P.M.-9 P.M.
sandbar: daily 11 a.m-5 p.m.